Melaver McIntosh was engaged by a major southeast city to secure funding for a plan to revitalize the western edge of its urban core through transportation improvements, economic development, neighborhood revitalization, affordable housing, green building strategies, and code revisions. The objective: Pull together five overlapping master plans and assemble a broad range of stakeholders to shape a comprehensive approach and funding proposal for a 4.5-mile sustainable, multi-modal development corridor. 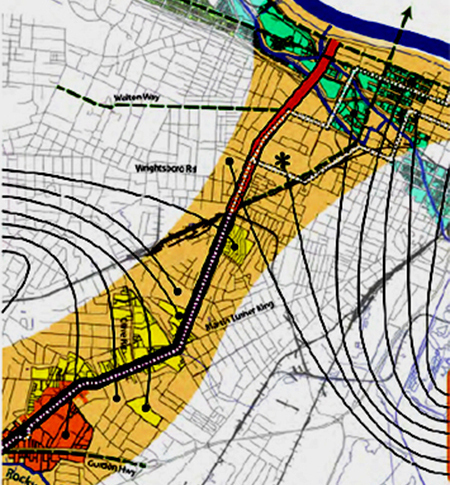 A TIGER II/HUD funding proposal, resulting in an award of $1.8 million to fund a planning-to-implementation program for a priority development corridor in the heart of the city. This successful proposal outlined a comprehensive approach, governance structure, public outreach plan, and metrics for: 1) a detailed plan and implementation program for transit-oriented developments; 2) a detailed plan for a multi-modal transportation corridor; 3) analysis of ordinances to facilitate higher-density, mixed-use, mixed-income development; and 4) an implementation plan for green, affordable housing.